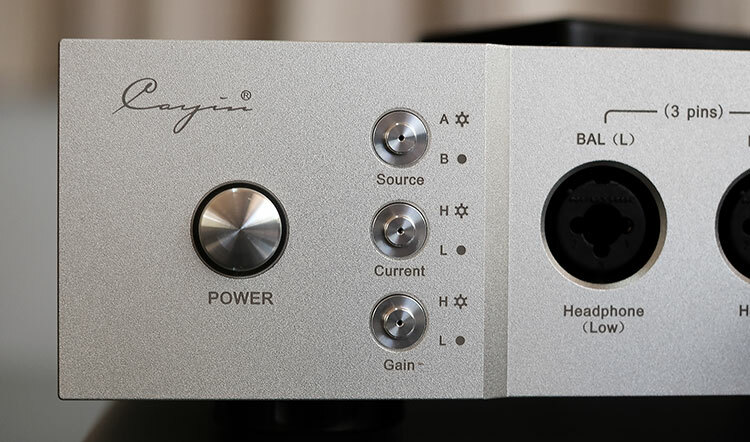 Such has been the hype regarding their well received portable audio products in the last 18 months you would be forgiven for forgetting that Cayin’s bread and butter were, and perhaps still is, desktop components. Cayin has been churning out both tube and solid state as well as source components (CDP) for many years now, but with the launch of the iDAC-6 and iHA-6 module component system, this is the first time they have a merged vision specifically for headphone users. If you also happen to visit their website they even have a dedicated section now for headphone users “Headfi” where you can find the iDAC-6 and iHA-6 so the product positioning is obvious. Priced at $999 for each unit is hovering around mid-tier for desktop solutions so it is not in the uber pricing category, heck some might consider that fairly reasonable these days. Note this is a stacking combo, they are designed to complement each other hence we will view it as such. Also in August 2017, there will be a brand new 3rd module designed to go on top of the existing two so watch out for news on that because it should bring Cayin roaring into networking and streaming digital audio which is where I think they need to be. The iDAC-6 and iHA-6 are two very headphones focused modular pitches to the audiophile community. They are designed to be mutually complementary to each both in terms of design and compatibility yet stacking is not mandatory. You can buy one without the other and mix and match with your own components. Cayin, however, believes that as a system both are optimized to go together. 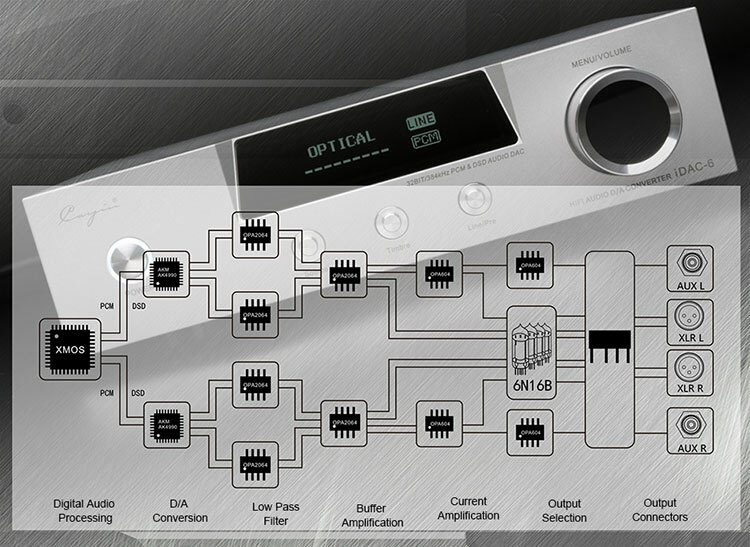 The IDAC-6 is the DAC and the iHA-6 is the amplifier. Both can be worked as singled ended but both are pitched as a fully balanced system in a form factor that is attractive for those looking for a powerful but compact desktop solution for digital and analog audio. The iDAC-6 is pretty much your modern digital audio orientated DAC sans wireless networking with a decoding capability of up to 32BIT/384kHz PCM and DSD256. It will take a digital source from your PC/MAC, CDP, your DAP or any other compatible source for that matter and output to an analog amp either of 3rd party origin or the iHA-6 with an unbalanced or balanced connection It will soon be able to accept a media server with the launch of the new iDAP module. It will not receive a line level analog input though from another DAC or similar source, purely digital inputs only but it can act as a pre-amp to an analog amp. 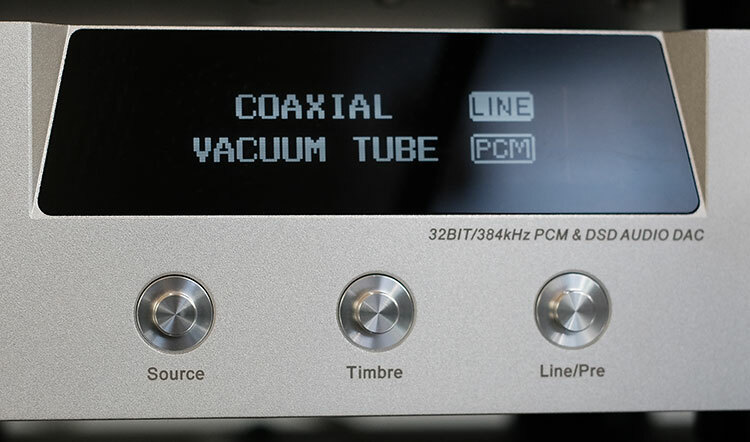 The IDCA-6 also deploys a tube buffer in its output design allowing you to switch between a solid state signature and more tube-like quality at the pressing of a button depending on how you setup your analog amp connection (balanced will automatically use the tube buffer). The iHA-6 is a full balanced discreet push-pull headphone amp with up to 2.2W into a 32 ohm single ended and an impressive 7w into 32-ohms load with its balanced output so it’s packing a bit of a punch. It can, of course, accept an unbalanced connection or output in single ended mode depending on your preference and you can feed it two sources and control which via the iHA-6 front panel. The iHA-6 has no less than four different types of headphone connections for just about every type of headphone out there included low impedance, high impedance, balanced 4-pin and balanced 3-pin left and right. It also seems to suggest that it can handle earphones in its marketing imagery. It can control both levels of current as well as two different gain settings. What the iHA-6 cannot do are are regular speaker connections, there are no binding posts, nor can it double up as a pre-amp, there are no analog outputs. And yet it does not end there. The modular pitch means the product life cycle of “I” series module desktop of which these two units are the foundations is still continuing. In August 2017 Cayin will release a networking and streaming module, in much the same shape and design as the iDAC-6 and iHA-6 making this a digitally connected triple stack. Not only can you connect your Cayin DAP as a source but you will soon be able to tap the internet via your mobile phone and BT your favorite streaming content via a mobile phone or the Cayin DAPs. 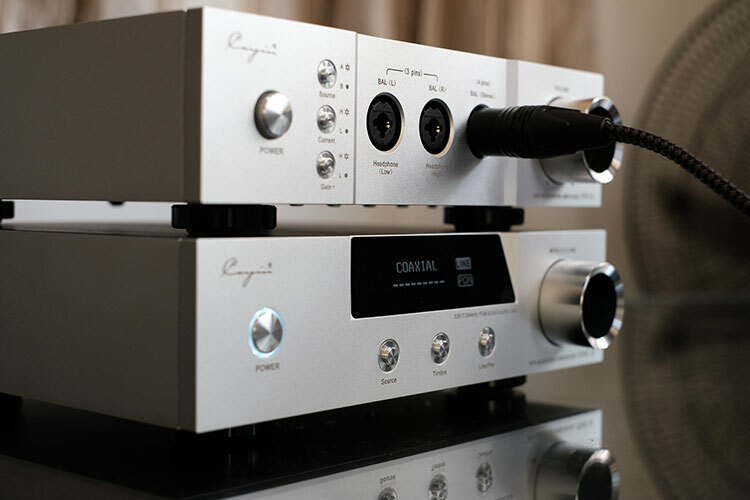 If you were interested in what Sonica DAC from Oppo could so from our previous review I am expecting something similar from the new Cayin module. The price point is fairly modest, particularly having gone through our testing for the last few months we can say hand on heart the price is a solid pitch at $999 each. Granted the Oppo Sonica DAC is $799 and has that ES9038PRO chip inside but it does not have a complimentary stacking amp so it is more of standalone DAC than anything. Still its strong competition and at $999 I think Cayin priced this sensibly. Both units weigh in a 3.8kg so around 1KG lighter than the Oppo Sonica DAC and close to 2KG lighter than the Schiit Moljnir amp. As such you could classify them as fairly compact with a width greater than the height of 240mm X 252mm X 69mm(WxDxH) making it shallower than the Oppo equivalent by some margin. By the way, those measurements and weight are for both as have an almost identical form factor and are designed to sit cleanly on top of each other in an aesthetically pleasing manner with rubber shock absorbing feet at the base of each unit. Stacked on top of each you also begin to see the harmonization of design in terms of placement of the controls on both front and back panels of each unit. Both the volume controls and the LED encircled 3D-molded power buttons are positioned in the exact same place, the rear balanced and unbalanced connections are right on top of each other also. The chassis of both units are cut from a solid aluminum alloy and coated with a sandblasted finish to reduce potential external interference. They are extremely solid to the touch despite their relatively light weight and do not feel as hollow as say the Mjolnir does when you do the “knock” test. There is very little in the way of nuts and bolts sticking out from this design. DIY they are most certainly not and the only visible screws can be found at the back and bottom plate making this a fairly smooth if somewhat edged finish. I say edged because the corners are a bit more ‘edged’ than rounded though smoothed enough to avoid classifying them as sharp. All labeling for functionality is either etched into the metal chassis (front plate) or in clear white decals printed on the black back plates. One thing I did find with the labeling on the front plate is the angle of view is somewhat limited. At certain angles, they are hard to read, such as slightly to the side or above which is where I tend to reside most of the time. You have to be face-on to read them easily. One key difference is the display on the iDAC-6, whereas the iHA-6 has no such display instead using the center panel for headphone output jacks. The trapezium shaped OLED display on the iDAC-6 is positioned at a 15-degree angle into the chassis for legibility purposes making it much easier to read from wider angles. From there you can pretty much read whatever you input from the main control button set just below as well as the digital volume control if you elect to use variable volume rather than a fixed line-out volume. I actually find the anti-aliasing better on the iDAC-6 OLED display than the SONICA DAC version, producing a much smoother graphical output in the process. That, combined with the angular positioning makes this a very easy LCD display to read. The iDAC-6 does not have a remote control so all functionality is manually adjusted through a set of 3 buttons and digital volume dial. The three buttons on the front panel control the source selection, timbre of the analog output and whether to use the iDAC-6 as a pre-amp of bypass with a direct fixed line out to the amp of your choice. The central button on the front panel will likely be a talking point in terms of tonal control on the iDAC-6. The iDAC-6 deploys a 6N16B miniature tube buffer stage in its design. If you are using an unbalanced connection you can opt to output a signal to your amp via the tube buffer or not. This is denoted by ‘transistor’ or ‘vacuum tube’ on the OLED display when going through the options, transistor basically meaning a more solid state sound. One thing to note however in balanced mode you cannot bypass the tube buffer, it is automatically used. The tubes are not replaceable either so this baby has a limited lifespan though I would be measuring that perhaps in decades or years rather than months given the tubes are rated at a minimum of 10,000 hours usage. The volume knob on the iDAC-6 is not a true analog pot, it is both a digital volume control for pre-amping and a menu selection controller for phase and DAC filter control. Much like Cayin’s DAP products which also use AKM DAC chips the iDAC-6 is also able to tap and navigate through various digital filters to tweak the sonic signature of the audible output. It can also change phase selection from normal to inverted to wipe out any phase anomalies in your recorded tracks and keep them sounding ‘thinned out’. 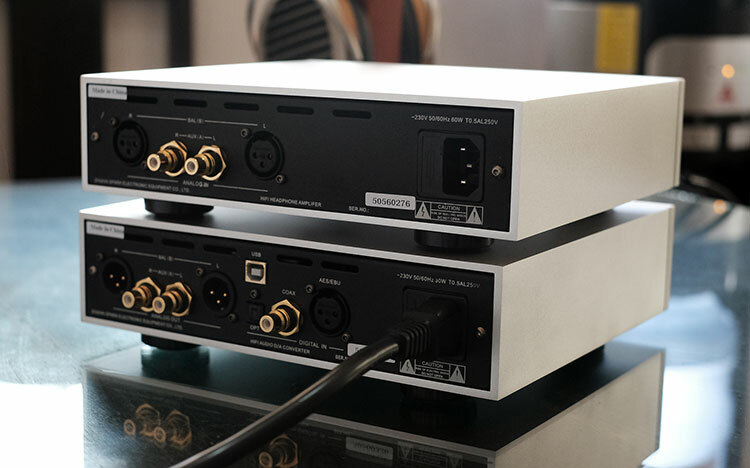 The rear of the IDAC-6 deals primarily with all signals both analog and digital, balanced and single-ended. To the far right you 2 sets of analog outputs, dual RCA left/right single ended and left right/XLR 3 pin balanced. 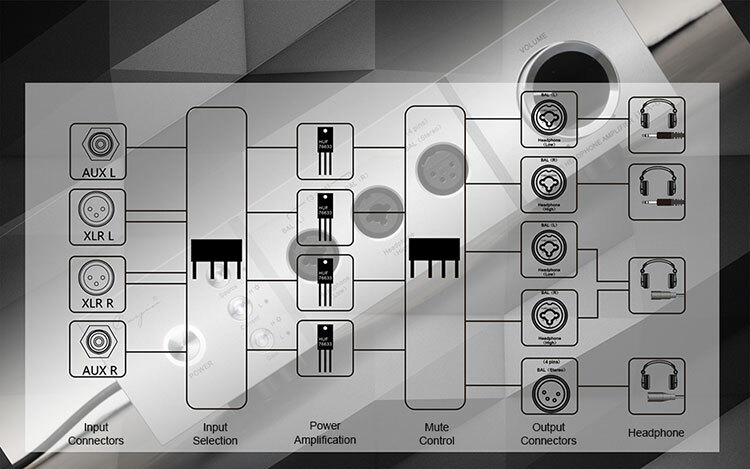 In the middle, you have 3 digital inputs, USB, coaxial and optical. You also have an additional AES/EBU connector for devices that use this digital format. The power supply in the iDAC-6 is an independent non-switching design using a custom made toroidal transformer to keep that weight and cost down. It should also produce a much lower noise floor than switching alternatives as well as further reduce external interference. They are usually much more durable than switching power designs such as the one you will find in the Oppo Sonica DAC. It is all analog with the iHA-6 so instead of that big OLED display on the iDAC-6 you get a set of headphone output sockets in the center of the front panel and 3 vertically aligned buttons to the immediate left of the output jacks to control source, gain and current. However, there is a method in the madness of the front panel jack array on the iHA-6 It is not a simple set of jacks such as you would find on the Studio 6 because each jack has a varied purpose. This is what makes the iHA-6 quite unique for me with its combination of gain, current button control and low and high impedance jack outputs allowing you to match a relatively wide range of headphones fairly accurately. The far left single-ended jack output is for low impedance and left channel balanced output. The right single-ended jack output is for high impedance and the right channel balanced output. 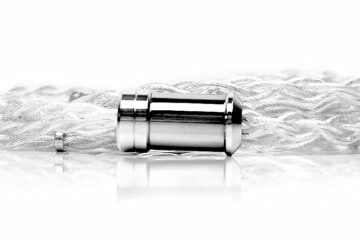 The final jack is a 4-pin XLR for a single balanced output. Interestingly, the resistance values of all 3 outputs tend to place the balanced output as by far the most flexible for low impedance headphones and more sensitive earphones (if you have converter cable) measuring at just 0.3 ohms (<1 ohm). The low impedance output is set at 10-ohms and the high impedance is set at 120-ohms which makes them less than ideal for 16-32 ohm loads even when using the low impedance output. 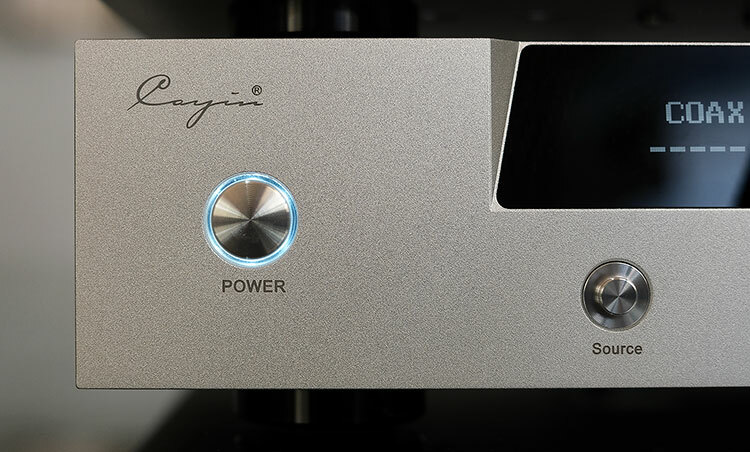 Given the low resistance and up to 7W on tap for the balanced output this is likely going to be the go-to connection for planar headphone users and even efficient headphone users with the iDAC-6 on pre-amp duty to free up some volume wiggle room on the iHA-6. The back plate of the iHA-6 is not that complex with only a single set of dual RCA unbalanced and a single set of XLR 3-pin balanced inputs and an independent non-switching power design using a custom made toroidal transformer power supply that comes with the iDAC-6. The iDAC-6 uses a dual AK4490 DAC chipset and a Texas Instruments OPA604 and OPA2604 analog stage with a quad 6N1B vacuum tube buffer component to allow for that switching between a pure solid-state or transistor output or using the alternative vacuum tube buffer stage output from the front panel switches. Now the AK4990 is perhaps a bit long in the tooth by today’s standards but it’s still a highly regarded chip-set for my money and most engineers whom I talk to say it is, or was, much easier to work with than the older ES9018 series which was the default alternative until the ES9028/38PRO series came out late last year. Implementation wise there is a lot Cayin have put into the iDAC-6 to allow its XMOS processor and AK4990 dual DAC design to sound and decode optimally from the independent non-switching power supply using a custom made toroidal transformer to keep noise to a minimum, dual crystal oscillators, and phase selection capability. Cayin has also opened up the digital filter of the AK4990 via the front panel so you can tweak the sound signature of the iDAC-6 alongside the timbre controls (tube buffer selection). Just note that THD-N numbers will be a little higher with the tube buffer stage than going pure solid state at ≤0.8% (Fs=192kHz) compared to ≤0.004% (Fs=192kHz). For tube usage that’s fairly normal. You will also get better SNR numbers from the solid state output at 110dB compared to 105dB for the tube buffer output. Decoding capability is as about as wide and commercially relevant as you can expect, though not to an ES9028/38PRO level. It will support up to 32BIT/384kHz PCM and up to DSD128 which covers pretty much most commercial recordings though I would have liked to have seen DSD256 capability. It will also support pretty much every codec you will need from MP3, OGG up to WAVE, ALAC, FLAC, and of course DSD/DXD. Importantly the iDAC-6 supports DoP (DSD over PCM) on it coaxial digital input and AES/EBU and will decode DSD at 1BIT (requires front end digital equipment supports DoP output on Coaxial). The iHA-6 packs a quadruple amplifier circuit with full discrete components and fully-balanced circuit design. Like the iDAC-6 it incorporates an independent non-switching power supply to left and right channel to reduce potential power interference. The iHA-6 is a push-pull amplification design with a low-resistance MOSFET (HUF7633) setup at its power amplification stage and sporting some heavy duty 40,000uF rated cap filters (WIMA). The numbers on the iHA-6’s output stages are excellent with up to 2.2w into a 32-ohm load for the single ended jack outputs and a huge 7W output for the balanced XLR output. 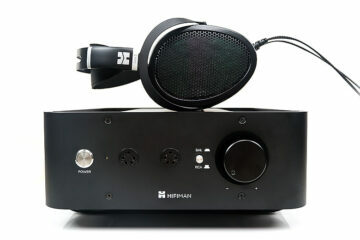 It will have no issues driving the likes of the Hifiman and Audeze planar headphones. For a more detailed breakdown, you get 1100mW+1100mW for high current into a 32-ohm load and 2200mW+2200mW into the low current mode also at a 32-ohm load. Switching to balanced you get 5000mW+5000mW (High Current, RMS,RL=32Ω) and 7000mW+7000mW (Low Current, RMS,RL=32Ω). SNR is rated at 105dB for single ended and 110dB for balanced output. Perhaps a bit spartan, plain or clean? Do you think it would work well with a pair of Focal Clear? I have no doubt it will (both together and individually with another amp or DAC).